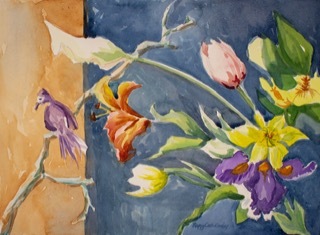 Peggy Call-Conley earned her BFA in Art Education in 1972 from Southeastern Massachusetts University. During her childhood, living in Boston she was exposed to the arts. A family move to rural Middleboro gave her solace and adventures in nature. When she arrived on the South Coast for college she lived in New Bedford and the villages along the coastline. She made her home in South Dartmouth and taught art in private and public schools for 35 years. She raised two sons Matt and Brendan both work in media production. Peggy has travelled to the Maine coast annually, revisiting an island where she lived and worked for one summer after high school. Through the photographs and paintings she made on these art retreats she shared her passion for the ocean and rocky coastline. 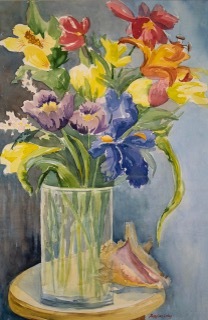 Graduate courses in art developed her desire to pursue fine arts further, especially watercolor painting. Between paintings, she enjoys family, music, yoga, and family visits to Los Angeles and the Pacific Coast. 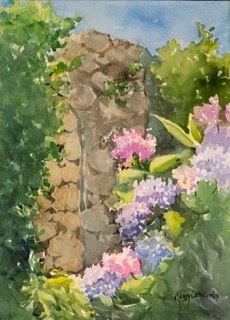 Former Westport Art Group Board Member, Peggy taught two watercolor classes there. Peggy continues to teach groups privately. 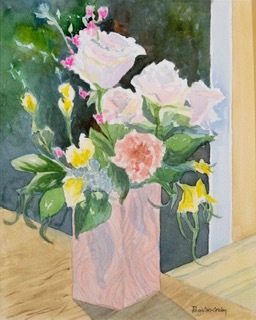 She received awards in juried exhibitions for her paintings. 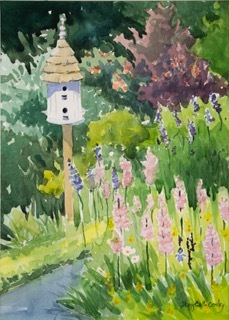 Peggy has also done commissions for private home and building portraits. Her paintings are in private national and international collections. As a plein air painter, she loves arriving at a location, lugging her gear, taking in the sights and sounds and being there. What catches her eye at first glance determines her composition. © 2019 NORTON GALLERY. ALL RIGHTS RESERVED.